5 Bedroom Gulf Front Home With Two Master Suites! (sleeps 16) - Incredible! This is an amazing Gulf Front house! “Sea La Vie” is a fantastic place to spend your next vacation! This gulf-front home is beautifully decorated and fully equipped with all your vacation needs. It is also Gulf Front with incredible views you don’t want to miss. Be sure to take advantage of this premium property! The spacious layout of this house is perfect for groups of up to 16 people with plenty of outdoor space on every level. The top floor and the main level of the house offer wide spacious decks facing the gulf, and there is a covered area beneath the house which can be used as additional space for kids to hang out! The main level of the home provides a spacious well stocked kitchen, bar seating for four, dining room with table for eight, and large living room combination. This inviting space makes it easy for everyone to gather for meals, games, conversation or to watch the large flat-screen TV. Along with the living areas, the main level has a large bedroom with two queen beds and a nearby bathroom. 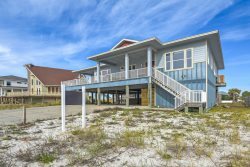 The upper floor of the home offers four bedrooms, two of which are gulf-front master suites! These bedrooms are almost identical in their size and features with both offering amazing views of the gulf, a private bathroom, a king-sized bed, a full-sized futon couch, and a door opening up to a balcony. What a treat! This top floor has two additional bedrooms with a nearby bathroom. One bedroom has two queen-sized beds and the other bedroom has a king-sized bed. The washer and dryer are also conveniently located on the top floor. The most important feature of this lovely home is the location, with the beach right out your front door! Just a short walk over the dunes and you can dive into the emerald waters of the Gulf of Mexico! This is one vacation your group will never forget. Book your 2018 stay before it’s too late!